Egg Cheese Burger recipe by abrarhussain_73 at PakiRecipes.com. Break the egg in a bowl and put black pepper powder and salt and beat it well. 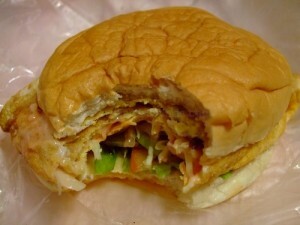 Horizontally half the bun by burger cutting knife or any sharp knife. Heat the griddle on medium heat. Put a little oil so that buns not stick to griddle. Now apply chili garlic and then mustard paste on the upper half of bun on cut side. Meanwhile put a little oil on griddle and pour the beaten egg on it. Don't fry it for long time otherwise egg will be harden or burnt. when one side is cooked flip it to the other side down on griddle. Now put the cheese slice on the fried egg which is still on the griddle. When the cheese is soften put the egg n cheese in between the bun halves. You can add cucumber, onion and tomatoes as per taste.